Teacher’s Comments: A fair, friendly course with many extras. Every town should have a golf course like Pine View. With a 6,500 yard 18-hole track, a 9 hole “executive” (Par 3) course, full-sized grass tee driving range, practice greens, a well-stocked pro shop, and lots of men’s and women’s leagues and family friendly activities, you could easily make this your golfing home. Pine View’s 18-hole course offers a fair and fun golfing experience for a wide range of skill levels. From the white tees (6262 yards), the bogey golfer can reach every green in regulation. The blues offer moderately more challenge at 6,526 yards. The red tees are well-placed, permitting the shorter hitters a good golfing experience. That’s not to say that the course is easy. The large greens are tricky and well defended. Several holes are defended by truly deceptive distances. And on the back nine, the tree lined fairways place a premium on accuracy. The whites play to a 69.610, while the blues are a 71.3/124. Still, a golfer who plays smart is going to score well. Pine View consists of two distinct nines. The front nine—the “Open Pines”—is easier off the tee, with plenty of grassy space for errant shots. 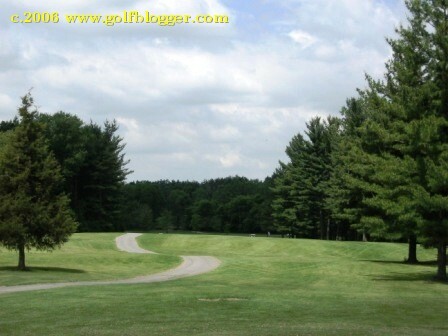 The back nine—the “Rolling Pines”—is much more difficult, with narrow, tree-lined fairways. The first hole is a 465 yard par 5 that I reached in two both times I played the course for review (photo, second from top, on right). That is followed by a reasonably easy par 3 and a par 4. At this point, the unsuspecting golfer will let down his guard. And from here, the course becomes slowly, increasingly more difficult. The fifth is a 505 yard par 5 where the entire left side is out-of-bounds. The tee shot requires you to hit to the right of a monstrous tree. A perfect shot here is a draw (but I don’t have that shot). The fifth ends on a monstrous, three tiered green. If you don’t land your ball on the correct tier, plan on a three-putt. The fifth is followed by a steep uphill par 3 that measures 185, but plays—depending on the wind—either twenty yards longer or shorter. Worse, the green is tiny and missing puts you in the woods. A pair of doglegs follow, one requiring a fade, the other a draw. The eighth is a dogleg right from an elevated tee box that requires you to make a decision: blast through the curve, play target golf to the corner, or smash it over the trees. Whichever you choose, you must be prepared to hit a high approach shot, for the green is elevated, small and hard to stick. 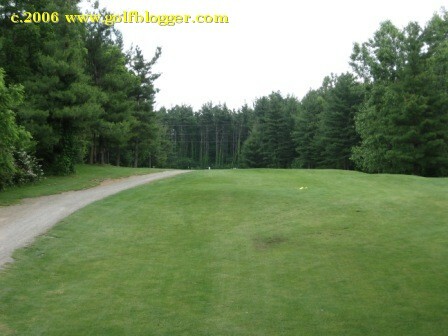 The back nine is cut through a pine forest. The tenth is a long, relatively wide par 5 with a slight bend to the left. At 523 yards, most hitters will need three shots to get there (see photo at top, on left). From the tenth, Pine View narrows appreciably. Errant tee shots will carrom into the woods. You can often find your ball, but advancing it will generally not be possible. Plan on taking your lumps and playing out sideways. The two par threes on the back nine are uphill shots to tricky greens. The five par fours are narrow, and require blind faith (see photo of the 16th, third down, on left). You can’t see the greens from any of the tee boxes. Just shoot at the fairways between the white stakes. The dogleg 16th holds a surprise for the unsuspecting golfer. In the middle of the fairway—just out of sight of the tee box—is a monstrous tree. 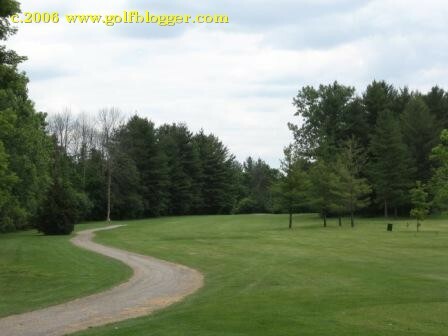 The unlucky duffer will find the tree on a perfect line between the ball and the green. If you can shape your shot, though, you can get around it. The final hole is a 559 yard par 5 with just enough bend to eliminate any chance of getting to the green in less than three. Accurate ball strikers will do well. You also can play well if you resign yourself to the fact that you really are just a bogey golfer and plan on getting to the greens in one over regulation. That was my plan of attack on my second review round there. To my surprise, when I added up the scores, I had shot an 88. That’s a good feeling. The course is well-marked, with stakes at the 100, 150 and 200 marks, and on the 250 on the par fives. It is eminently walkable. The second time through, I finished in just over three and a half hours. If you don’t have a push or pull cart, Pine View has some excellent Bag Boy three wheelers available. Conditions Pine View were generally excellent on the two occasions that I visited. The greens and fairways were in great shape. There are, of course, more weeds in the fairway than you would find at a tony upscale course, but it’s all filled in—no dirtspots here. 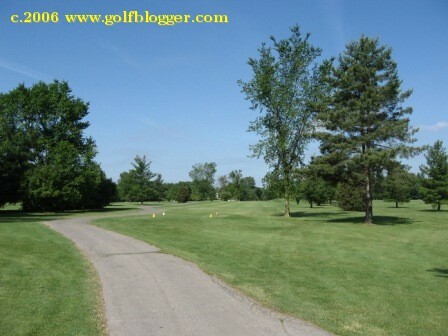 And I personally don’t care what I’m hitting off of in the fairway, as long as its green, and freshly mown. The tee boxes could use a little more work, though. The “Little Pine Nine” is an executive course with six par 3s and three par 4s that measures 1,818 from the whites. It’s actually quite the challenge, requiring you to use every iron in your bag—and accurately. Kids can play there for $1 with an adult. Junior tees offer a great introduction to the game. Clearly Pine View is a course taking a long-term approach to their business. Kids who play the Little Pine as juniors will want to play the big course as they get older. Practice facilities include a grass tee driving range, two putting greens and a practice bunker. The course offers summer programs for juniors, group lessons and complete golf classes. Bulletin board in the clubouse indicate that the course is the home of a number of local golf assocations, further cementing the impression that this truly is a community oriented course. The “Grill” is large and offers typical golf course fare—sandwiches, drinks and a variety of fried foods. The pro shop is marvelous for this kind of a course, with irons and woods from all of the major manufacturers, a wide variety of balls, as well as a good selection of bags, shoes and apparel. You can pretty much get anything you need to play golf right here. Pine View isn’t fancy—but for many, if not most golfers, it’s all the course you’ll ever need.